The Hurt Locker is a better-than-average war movie. It is gripping and has a strangely beautiful quality; but, it also lacks both a narrative arc and much in the way of developed characters. Let’s start with the good. 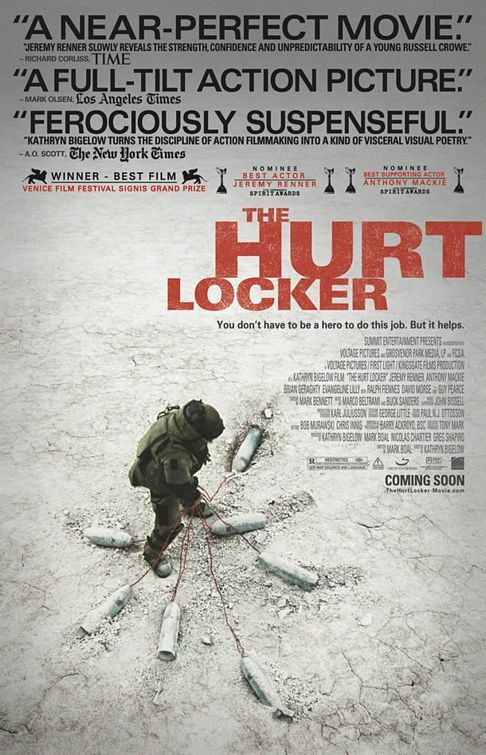 The Hurt Locker really nails you to your seat. This is a movie about men defusing explosive devices in occupied Baghdad. And the thing about explosive devices is, when you are trying to defuse them there is the risk that they will go off and cause spectacular death and damage. So there are lots of drawn-out scenes where characters try to figure out which wire to cut and what-not, and guess what: it creates suspense. Lots of it. The camera work in and the editing of The Hurt Locker is superb. Everything that happens, even the explosions, even the gun battles, has a harsh, stark beauty to it. Baghdad and the surrounding countryside is shown as a sort of straight-edged impressionist landscape, all whites and browns and bleached skies. Bigelow also wins big points for filming combat scenes in such a way that we always understand where the combatants are relative to each other, what tactics they are using, and why. That’s pretty key stuff in a war film. It’s good that the visceral, documentary qualities of the film are so strong, though, because there’s not much else to it. It is a highly episodic picture: the men defuse a bomb. Then they defuse another bomb. Then another bomb. And so on. The supposed point of the exercise is that certain men find the danger of war addictive, but that’s a simple idea that is spelled out perfectly plainly in the epigram that opens the movie. As far as characters go, well, there are three of them. One finds the danger of war addictive. One is cautious and wise but determined, and one is scared of dying in combat. That’s about as much as we get, as we generally see them engaged in expertly disciplined military activity, a field of endeavor which does not really lend itself to in-depth exploration of personality. One of them begins to develop into something resembling a point-of-view character before being whisked suddenly out of the movie, leaving us a little puzzled to be left watching the wrong half of the story. None of the above is especially problematic. There is a place for war movies – war is a lamentably a well-established part of the human experience, and recounting tales of war for our enlightenment, but really mostly just for our entertainment, is surely a practice much, much older than the Iliad. The Hurt Locker is a series of well-told war stories. Prognosis: * * * The blurb on the DVD box proclaims that The Hurt Locker is the “definitive movie of the decade.” That is too-generous praise. What we’ve got here is a good war movie, very probably the definitive movie about defusing bombs in occupied Baghdad of the decade. Now I really want to see it. A war movie that is filmed in a way where you can understand what is happening is something I don't think I've ever seen.